The sky is a deep Arizona blue and the hint of wind that sneaks around the windscreen in the open cockpit has a nice early morning chill. You quickly check your airspeed and altitude and then start a 40 degree dive for the desert floor 2500 feet below. When the airspeed hits 130 MPH, you pull to level, wait several seconds and then begin a crisp 4G pull to the vertical. As G-forces push you down in your seat and the nose comes above the horizon, you look out towards the sighting device on the left wing and watch the landscape nicely pivot about the wingtip. Easing off on the back stick as the you approach inverted, you float the airplane over the top with about +0.5G's and look overhead to pick up the horizon you left behind moments before. Leveling the wings with a slight aileron correction, you start down the back side. The wind noise picks up as the airspeed increases and you blend in increasing back stick to round out the loop, again pulling 4G's at the bottom as you fly with a slight bump through the turbulence of your own wake. Once again flying straight and level with the blue sky above and brown desert below, you can't suppress a brief smile as you set up for your next maneuver. Does this describe a type of flying that you'd like to do routinely? It's probable that many of us have thought about trying aerobatics at some time. This usually takes the form of either a demo flight for fun or perhaps a several hour unusual attitude - spin training course for safety. But, if you're like me, you probably hadn't thought of going any further than that ... particularly flying any sort of competition aerobatics, something that is surely only appropriate for well known aerobatic superpilots like Sean Tucker, Patty Wagstaff, or Kirby Chambliss. That's certainly the way I felt years ago. So, when I gave in to the urge and signed up for a beginning aerobatic course, it was with the thought that I'd fly a few hours and get to see the dreaded spin from the inside looking out. In the process I figured that I'd get some instructive exposure to the world from what the FAA euphemistically calls "unusual attitudes," all of course, in the interest of safety and pilot proficiency. What I didn't expect was how intensely enjoyable, safe, and accessible aerobatic flying can be ... particularly here in the sunny skies of Arizona. What is required for you to engage in this type of flying? Really only two things ... a well maintained airplane that is designed for the stresses of aerobatic flight and a qualified instructor that has the experience to teach you how to execute the maneuvers while remaining within the airplane's limits. The airplane will be generally stressed for +6 and -3G's or more, considerably more than most cross country machines. When performing the maneuvers, you will find that you will use a large part of this G-envelope, making aerobatics in normal- or utility-category airplanes an unnecessarily risky business. This also implies that even an aerobatic airplane needs to be well maintained and equipped with a G-meter to monitor stress loads placed on the airframe. The airplane will have multi-point harnesses to hold you securely in place when the gravity and acceleration pull you in odd directions and the vast majority will have tailwheels in place of the nosewheel. While no tailwheel experience is needed to learn to fly the maneuvers, you will find that a tailwheel endorsement is necessary if you plan to do solo aerobatics after training ... after all somebody has to land the airplane! Finally it's nice to have an inverted fuel and oil system that keep the engine running under negative G's since many aerobatic maneuvers will be difficult to perform without it. In some cases, you may get to fly an open cockpit airplane with two wings. Regardless, you will probably find most aerobatic trainers a delight to fly with responsive controls and good visibility. Not surprisingly, your instructor is equally important. Aerobatics can be relatively safe since it is learned at altitude (2000'-5000' AGL to start) and there is plenty of room to recover from a mishandled maneuver. In particular, many maneuvers take the airplane from near-redline to just above the stall. Combine this with full deflection control inputs and you have the distinct possibility of either an inadvertent spin or the airplane headed downhill in some odd attitude with the airspeed building up fast. The key is learning how to recover from these situations without putting undue stress on the airplane or yourself. Accordingly, your training will concentrate both on how to do each maneuver correctly and how to recover if you do it incorrectly. In this sense, every aerobatic training course will combine both an aerobatic maneuver and an emergency unusual attitude-spin recovery course. To do this safely, you'll want a CFI with more than a few hours of aerobatic experience. The FAA actually says very little about aerobatics and there is no special rating required for it. They do insist through the FAR's (91.303) that you fly aerobatic maneuvers away from congested areas, open assemblies of persons, federal airways, outside controlled airspace, above 1500' AGL, and in greater than 3 statute mile visibility. The FAR's simply define aerobatic flight only as those maneuvers not necessary for "normal" flight. If you wonder how airshow pilots get away with breaking this regulation, there is a provision for special waivers for the airshow airspace (designated aerobatic "boxes") and low level aerobatic waivers for the pilot, based on demonstrated competency to the FAA or a designated evaluator. Another section of the FARs (91.307) says that all occupants will wear a parachute when engaging in these maneuvers whenever anyone besides required crew members are aboard. In practice, almost all aerobatic pilots routinely wear parachutes and generally most aerobatic airplane seats would be practically unusable without them. What will you learn if you sign up for a 5-10 hour aerobatic training course? First, you should be introduced to the basic handling characteristics of your aerobatic trainer: slow flight and various stalls. While this may seem a prosaic way to start, it is important to realize that many maneuvers will have some part flown with nearly full power on the edge of the stall. Most schools will then introduce you to the basic aerobatic maneuvers: the slow roll, inverted flight, the inside loop, the hammerhead turn, and the spin. Learning the roll starts with simple aileron rolls: dive for speed, pull up about 30°, put in full aileron and a bit of rudder, watch the resulting show, and neutralize the controls once the horizon is back in its accustomed place. Then the real fun starts, performing slow rolls which use the rudder and elevator in addition to the aileron to keep the nose pinned on a point on the horizon. You'll learn that rudder coordination doesn't always mean moving the aileron and rudder together and that keeping the nose from dropping will require forward stick when inverted. This will also be your first introduction to an interesting sensation when you pull negative G's while upside down, hanging from your belts. If you're like me, you'll find the slow roll frustrating at first, requiring constantly changing and seemingly odd combinations of aileron, elevator, and rudder. Once you begin to master it, you'll have an whole new understanding of how aircraft control surfaces really work. The slow roll is truly basic in that it forms a part of many other maneuvers and, more importantly, is your key to recovery from any unintentional inverted flight. ... a slow roll in action! This points up an important side benefit of aerobatic training. Unexpectedly presented with an airplane in an inverted attitude, the average pilot without aerobatic training will pull on the stick and perform a high-G, high speed half loop back to level flight (a Split-S). Doing this can easily turn into a test of the airplane's G-rating, redline airspeed, and remaining altitude. The penalty for failing this test is severe. Aerobatic training will instill the proper response: recover from inverted with a 1/2 slow roll. Once you can roll inverted, you will learn about sustained inverted flight and all of the unusual effects that has on pilot orientation and control coordination. The inside loop will follow and you'll have a second method of rotating the horizon about the airplane. Finally, you'll do a hammerhead turn by pulling the airplane up into the vertical and then pivoting it on a wingtip just before the airspeed hits zero. At this point you will have experienced dramatic ways of rotating the airplane about all three axes: roll, pitch, and yaw. The final maneuver you will learn in basic aerobatics is the spin. The FAA takes great pains in primary pilot training to teach pilots to avoid spins. The unfortunate truth is that far too many pilots still encounter unintentional spins every year with disastrous results. Aerobatic training will teach you how to get into and out of a variety of spin situations. In doing these and the other maneuvers, you will learn a great deal about rudder coordination and what it really takes to avoid a fatal unintentional spin at low altitudes. It also prepares you for the occasional botched aerobatic maneuver where a combination of high power, low airspeed, and improper control use puts you into an unexpected spin. Once you can competently, if not perfectly, perform these basic maneuvers (typically after 4-6 hours), you can move on to simple combinations, such as the 1/2 Cuban eight, the reverse 1/2 Cuban eight, the Immelmann, the split-S, and the snap roll. One factor that is faced almost immediately by the aerobatic student is how to deal with airsickness. Aerobatic flight presents you with a wide variety of unaccustomed sensations. This will for most people lead to some form of motion sickness after a while. As long as you recognize the symptoms and stop early, this is quite manageable. Bill Kershner refers to this as "not so much fun anymore." As soon as your enthusiasm begins to wane, you can be sure that the first symptoms of airsickness will soon follow. Take the hint and quit early. Your first lesson may only last 15-20 minutes, but with continued exposure your lessons can quickly increase to 45 minutes or longer with no symptoms at all. After 10-12 hours of aerobatic training, most pilots are competent to fly aerobatics solo, assuming that they have access to an aerobatic airplane and have the appropriate tailwheel proficiency. It is rewarding to go out on a regular basis and fly the maneuvers described earlier just for fun. Over time you can develop finesse in their execution and add interesting new maneuvers to your repertoire (with additional training recommended for those which are substantially more difficult or different). By stringing maneuvers together in a sequence, you can add challenge to them and will quickly learn that aerobatics is really an exercise in energy management. Most maneuvers require either very high or very low entry speeds and then exit with high or low speed. A successful sequence requires that you combine a high or low speed exit from one maneuver with a corresponding high or low speed entry to the next. This constrains the combinations you can fly and requires precision and finesse to keep from quickly squandering your available altitude. Perhaps the best way to develop your skills further is to engage in aerobatic competition. The International Aerobatic Club is a division of the Experimental Aircraft Association and organizes local aerobatic competitions at all skill levels, ranging from beginners to Unlimited class National Champions. IAC runs local contests divided by skill levels ranging from Basic (three maneuvers) to Unlimited (any aerobatic maneuver you can imagine). Most competitors start at either the Basic or Sportsman level. In a Basic routine, the pilot performs a one turn spin, a loop, and a slow roll. He or she can have a safety pilot on board and only needs to stay above 1500' AGL throughout the sequence. This could normally be done by a graduate of a typical aerobatic training course using the same airplane and CFI and does not require a solo sign-off to fly. Many starting competitors bypass the Basic category for the Sportsman. Here the skill level required is increased significantly. The maneuvers are all of those described earlier, but must be flown inside an aerobatic "box" that is 3300' on a side. The maneuvers must remain within a 2000' altitude block from 1500' AGL to 3500' AGL. Each year, the IAC publishes a "known" sequence of 10-12 maneuvers for the Sportsman category that is flown at all contests for that year. Each maneuver of the known sequence must be completed in order and in the indicated direction. Since two or three sequences are flown in a competition, the Sportsman pilots also have the option of flying the second sequence as a "freestyle" which they construct themselves. Most beginning competitors have enough problems getting through the known sequence without error and will simply fly it again. In lower powered aircraft, you also have to quickly learn to fly maneuvers at entry speeds well below the ideal speeds taught in basic aerobatic training. This adds a lot of challenge, but helps preserve your precious store of altitude and energy. These requirements greatly increase the level of finesse and precision that is required for each maneuver and is a great way to improve your proficiency in flying the maneuvers. One nice feature is that the floor of the box is 1500' AGL for safety and thus does not require an aerobatic waiver per the FAR's. Thus you can practice your Sportsman sequence in any uncongested airspace meeting the other few requirements of the FAR's. Once a competitor becomes proficient at flying sequences at the Sportsman level, he or she can move up to the higher levels. In Intermediate competition, the complexity of the required maneuvers increase a bit and the pilot must fly known, freestyle, and, for the first time, unknown sequences. The unknown is first presented to the pilot at the competition and must be flown in front of the judges without practice. The floor of the competition "box" moves down to 1200' AGL in this category. The Advanced level adds significantly more difficulty with emphasis on physically uncomfortable "outside" (negative G) maneuvers, complex combinations, and an even lower floor of 800' AGL. Finally, the Unlimited category is, as the name implies, aerobatics at the limits of what the pilot and the airplane can safely allow. The floor of the "box" moves down to 328' AGL and any conceivable maneuver is fair game. Not surprisingly, it takes a special pilot and state of the art airplane to perform well at this level. Arizonans can note with some pride that two of the best Unlimited aerobatic pilots in the country have been from Arizona, Kirby Chambliss of Tempe (past IAC Unlimited champion, multi-year U.S. Team Captain, and ranked #4 in the world at the 1998 World Aerobatics Championships, from IAC Chapter 69) and Diane Hakala of Phoenix (1997 U.S. National Champion, U.S. Team Member, ranked #2 woman in the world an the 1998 WACs, from IAC Chapter 69). An IAC aerobatic contest is designed to be accessible to a wide spectrum of aerobatic pilots. Most local contests start with registration and practice on a Thursday, competition on Friday and Saturday, with Sunday reserved for weather delays. Registration is straightforward but will include a technical inspection of each competitor's aircraft and paperwork by designated IAC safety inspectors. The high level of emphasis on safety is attested to by the fact that no fatality has ever occurred in an IAC sanctioned aerobatic contest. Once the competition starts, each sequence at each level is flown before a panel of 5 judges who rate each maneuver on a scale of 0-10. Every maneuver has certain required elements and execution standards and every judge must attend an IAC Judging School where these are exhaustively covered. Each score on a maneuver is multiplied by a difficulty rating or "K" factor that is derived from an aerobatic catalog published by the FAI (Fédération Aéronautique Internationale, the accepted international aerobatic sanctioning body) and additional deductions are assessed for improper positioning in the box. Finally, any maneuver which lies even partly outside the boundaries of the box are rewarded with a substantial penalty. All judges' scores are then combined via a complex statistical process and the competitor's performance is rated as a percentage of a theoretical perfect score of 100%. In reality, winning scores will lie in the 80's ... perfection is eagerly sought, rarely achieved! I hope that I've raised your interest level in local aerobatics and that you will want to investigate further. If so, there are several things you can do. The local chapters of the IAC sponsor several contests over the course of the year, all of which are free to come out and watch. There is a Basic and Sportsman only contest, the Bill Briski Akrofest, held at the Casa Grande Municipal airport in south of Phoenix in late February/early March. This is an ideal contest for the beginning aerobatic competitor. 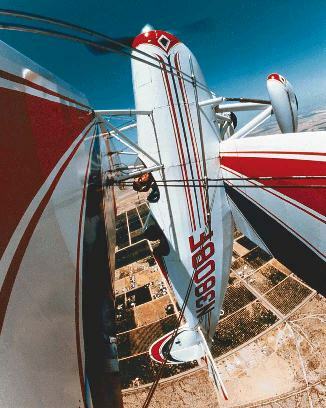 There is a second contest, the Copperstate Aerobatic Competition, held in late March/early April in the Phoenix area. The Tucson chapter hosts the Tequila Cup at the beginning of November at the Marana NE Tucson Regional Airport. Finally, the Phoenix and Tucson chapters sponsor the Arizona State Championships in early December, normally at Casa Grande. Watch for more details in the Arizona Flyways or contact the IAC at the addresses below for more information and come on out and see what's it's all about. By the way, don't be shy about asking questions about the proceedings, like all pilots, we love to talk flying! Finally, feel free to contact the local chapters of the IAC for more information. In Phoenix, Chapter 69 can be contacted via our homepage. In Tucson, contact Chapter 62 via their homepage. We'd like to hear from you! Reprinted from ARIZONA FLYWAYS, Jan-Feb 1997. All rights reserved, George Norris, 1996-2003.